The chaos of the holiday season and busy sales floors are welcomed by retailers—and thieves. Addressing holiday theft prevention is a key step to protecting your store’s profits. Here a few tips to make the season merry, bright, and profitable. Setting your store up for the holidays is the first step to addressing loss prevention over the holidays. One of the best ways to notice opened packaging, missing product, and misplaced items is to keep the shelves well-stocked and maintained. Encourage staff to straighten shelves and walk the floor frequently. Beware of holiday decorations. While Christmas trees, garland, and wrapped presents set a festive scene, make sure they aren’t creating new problems. Watch your holiday window displays. A focal point for customers, they are often ignored by employees and staff. Additionally, before the chaos begins, be sure to clean and focus your surveillance cameras on cash registers, front and back doors, and areas of high theft. Make sure your NVR or recording device is functioning properly and address any service issues before the holiday season. As a successful retailer, your goal is to hire well and train even better. Hold a pre-holiday season training session and review your store policies with all employees, both old and new. Review holiday discounts and upcoming sales and discuss proper protocols. Keep sales flyer by the register for review. Cover your store policies on gift cards and cash handling protocols. Reiterate your key management policies. Conduct a frequent count on store and case keys. Test your technology early in the holiday season, including your POS integration, RFID tags, traffic counters, etc. Get your staff on board by being transparent about the importance of the holiday season and its profitability. Make sure you are adequately staffed for the holiday season, including peak times and special events. This probably means some seasonal and last minute hires. Don’t skimp on backgrounds checks and checking references on seasonal employees. Finally, protect your employees during the stressful holiday season. This includes strict protocols and protection as they make deposits or leave the store after hours. Most importantly, make sure your staff has quality time with their families over the holiday season. Small perks like a provided lunch or holiday bonuses can go a long way to make employees feel appreciated and give you the edge in hiring the best. Addressing holiday theft prevention is a year-long process. Hopefully many of your loss prevention strategies are used every day but it’s important to re-emphasize their importance during the busy holiday season. 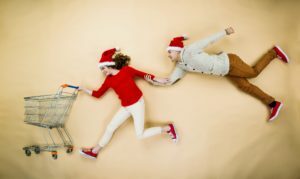 Need more insight into holiday theft and its prevention? Join us for a FREE 30 minute webinar on Loss Prevention over the Holidays on Thursday, November 8th at 11 am EST. RSVP today for your space on the call. Jim Close is the Director of Loss Prevention at DIGIOP, bringing over 25 years of experience in all facets of Loss Prevention. His work with retailers spans from shoplifting to internal theft.